Samgyeopsal is a popular Korean dish. Commonly served as an evening meal, it consists of thick, fatty slices of pork belly meat (similar to uncured bacon). The meat is not marinated or seasoned, and cooked on a grill at the diners' table. Usually diners grill the meat themselves and eat directly from a grill. Left: Samgyeopsal being grilled with sliced onions and garlic on a hot plate. The most common accompaniments for samgyeopsal are lettuce and sliced raw garlic. But very often the meat is served with other accompaniments such as perilla leaves, sliced green chili peppers, Korean-style green onion salad, sliced raw onions, and aged kimchi. Garlic, onions, and kimchi can be either grilled with the meat or consumed raw with the cooked meat. Soju, a traditional Korean alcoholic beverage, is also very often consumed with the meat. Samgyeopsal is almost always served with dipping sauces. The most common one is ssamjang, a paste consisting of Korean chili paste, Korean soybean paste, sesame oil, and other ingredients. Prior to consumption, the large slices of meat are cut into smaller bite-sized pieces with scissors. 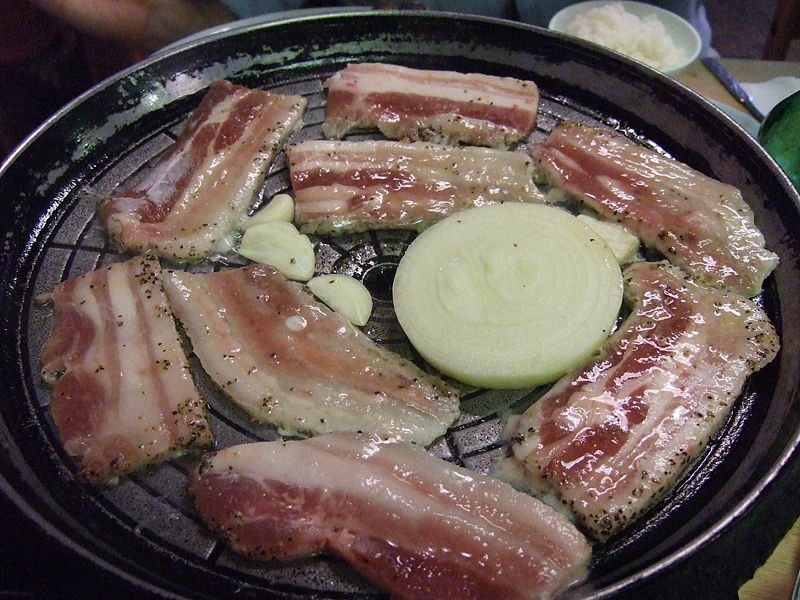 A common way to consume samgyeopsal is to place a slice of the cooked meat on a leaf of lettuce and/or a perilla leaf with some cooked rice and ssamjang, and to roll it and eat it. It is usually called sangchu-ssam. One can add any combination of vegetable accompaniments mentioned above to the roll according to one's preference, but the most popular ingredient is sliced garlic.